The play begins in Paris, France, in the year 1640. The first act takes place in a hall of the luxurious Hotel de Bourgogne (not an actual hotel—more of a large meeting place or theater), and as Scene I begins, the hall is still dark. There are chairs arranged before an empty stage. As the scene goes on, people walk into the hall and sit down. Many of the people in the crowd are soldiers: troopers in the French army. One Trooper announces to the crowd that he’s been admitted to the Hotel for free because he’s a member of the King’s Cavalry. In the first scene of his play, Rostand paints a vivid picture of life in 17th century Paris: the period between the Middle Ages and the Enlightenment. During this time, social stratification was slowly beginning to wane—wealthy, powerful people rubbed shoulders with the poor to an extent that would have been inconceivable in earlier centuries. And yet the state military—an institution that, in France, dates back to the beginning of the Middle Ages—still dominated public life. In short, 17th century France was transitioning from military medievalism to an emphasis on learning, democracy, and equality. The crowd is waiting for a play to be performed. To pass the time, the Troopers fence with their foils (fencing swords). At the same time, the Lackeys—servants of men with higher social status—play cards and dice. A Guardsman flirts with the Flower-Girl and tries to kiss her. The crowd discusses the play that is to be performed: it’s been written by a playwright named Balthazar Baro. As people talk, a Pickpocket strolls around the room, snatching wallets and handkerchiefs from people. Cyrano de Bergerac is essentially a play about playing—that is, it’s about the importance of acting, pretending, and “seeming,” and how appearances affect identity. Rostand immediately signals this theme by beginning with a “play-within-a play,” a dramatic device made most famous by Shakespeare’s Hamlet. There is a commotion in the hall: three wealthy Marquises (noblemen) are going to enter the room. The First Marquis enters and greets his two friends, Baron de Cuigy and Baron de Brissaille. In this first scene, Rostand conveys the “democratic chaos” of life in France at the time: the elites of society bump into the working classes, spurred on by an artistic event. Arn, Jackson. "Cyrano De Bergerac Act 1, Scene 1." LitCharts. LitCharts LLC, 21 Mar 2016. Web. 22 Apr 2019. Arn, Jackson. "Cyrano De Bergerac Act 1, Scene 1." LitCharts LLC, March 21, 2016. 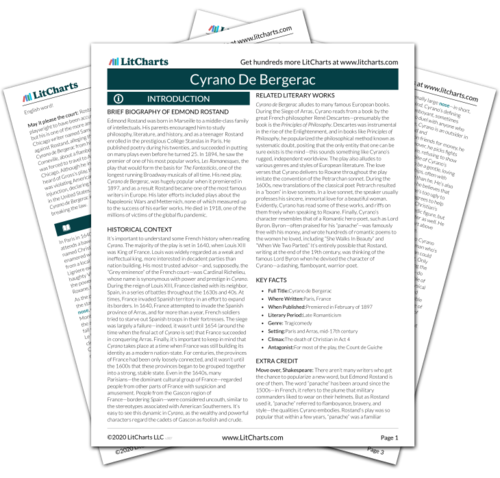 Retrieved April 22, 2019. https://www.litcharts.com/lit/cyrano-de-bergerac/act-1-scene-1.